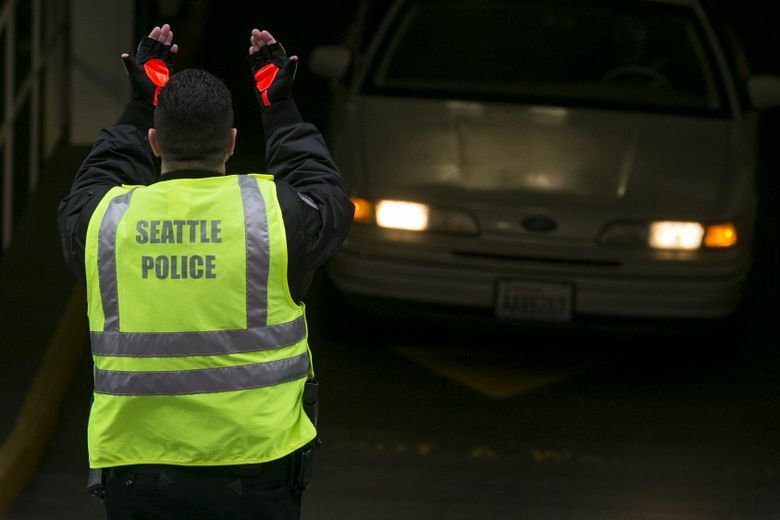 For years, the Seattle Police Department has wrestled with the murky world of off-duty work. At best, the practice of officers working security or directing traffic helps promote good behavior at movie theaters and ballgames, and keeps cars moving around construction sites and from parking garages at rush hour. At worst, officers have flouted off-duty work rules, including one officer who turned the Belltown entertainment district into his personal playground before he was fired in 2005. He got free meals and drinks on the job, internal-investigation records showed, and set up off-duty security work at nightclubs for himself and other officers in violation of department rules prohibiting employment at liquor establishments. The issue resurfaced last week when it was disclosed the FBI was investigating allegations that Seattle police officers, with the help of the Seattle Police Officers’ Guild (SPOG), may have engaged in intimidation and price-fixing while working lucrative off-duty jobs directing traffic at parking garages and construction sites. “It’s back to the future. Nothing changes,” said one former law-enforcement official who worked on the Belltown case more than 10 years ago and requested anonymity. While there have been patchwork efforts to fix problems over the years, the overall system still operates outside the control of the Police Department with little oversight. The current investigation stems from the efforts of an Olympia-based startup company, Blucadia, to break into the lucrative off-duty market in Seattle with its Uber-like model of matching customers to officers seeking off-duty work. It was given a portal on the Police Department’s website earlier this year, putting it in competition with two long-entrenched companies that provide police-guild members to private employers. Brian Maxey, the Police Department’s chief operating officer, also offered his own personal endorsement on the company’s website, to the displeasure of Kevin Stuckey, the president of the Seattle Police Officers’ Guild. Blucadia officials allege they have been blackballed by SPOG and have encountered reluctance among potential business clients afraid of angering police, worried they won’t show up for traffic control or emergency calls. After Blucadia complained to Seattle police in the spring, Police Chief Kathleen O’Toole referred the allegations to the FBI and the department’s internal-investigation unit, the Office of Police Accountability (OPA). Stuckey said the guild has done nothing wrong. The allegations hark back to the early 2000s, when off-duty work spun out of control. Dozens of officers worked security jobs at nightclubs and bars in Belltown and elsewhere, repeatedly violating department rules while their supervisors looked the other way. Working in police uniforms, the officers sometimes put club owners’ interests before their duty to protect the public, a 2005 Seattle Times investigation found. Some failed to help people injured in fights just outside bars, while others didn’t file police reports after learning of crimes. Then-Police Chief Gil Kerlikowske acknowledged it was a “loose system,” with problems that should have been caught earlier. The breakdowns spurred new regulations, but not an overhaul of off-duty work. Internal department watchdogs later warned about the dangers of allowing off-duty work to exist outside the department’s purview. Levinson’s complaints, along with a push by O’Toole and department officials, helped end the practice of allowing retired officers, who lacked up-to-date training, to perform security work in Seattle police uniforms. In one case, a retired Seattle police officer charged with criminal impersonation for working at a construction site with lapsed credentials agreed in 2014 to perform 150 hours of community service and pay $50 in restitution to a woman who complained he angrily grabbed and pulled her as she crossed the street. But the larger issues raised by Levinson remained. “This is all about money,” he said. In other cities, such as Denver and Portland, off-duty police work is managed by the department under city policies. The Denver Police Department administers all off-duty police work through its own “secondary employment” policies, which restrict officers from working at certain venues, such as marijuana dispensaries, requires additional training in some instances, and limits total combined on-duty and off-duty work to 64 hours per week. Officers also must receive prior approvals for off-duty police work from the department, which employs a “Secondary Employment Coordinator” responsible for assuring officers’ off-duty work is complying with city guidelines. “Anyone that wants to hire officers to work in a uniformed, off-duty capacity also needs to enter into a contract agreement with the city of Denver,” a Denver police spokesman said. Similar policies are in play in Portland, which also manages all off-duty work through contracts and imposes certain restrictions. Seattle officers also are subject to off-duty rules, including a marijuana-business ban and the 64-hour combined work limit. Officers must get permission to work off-duty, and department policy states their primary obligation is to serve the department and public. “Employees working off-duty must adhere to all Department policies and procedures and are held to the same standards of conduct and performance as those that apply to on-duty work,” the policy says. But the city doesn’t manage secondary employment, something Chief O’Toole has said she would like to see happen. Her efforts, however, haven’t gained traction in City Hall at a time when other burning issues have dominated, such as federally mandated police reforms to address excessive force and fractious talks with SPOG that have yet to yield a long-delayed labor contract. But a police-accountability ordinance passed by the City Council in May calls for the establishment of an internal office in the Police Department, directed and staffed by civilians, to manage the secondary employment of its employees. “The policies, rules, and procedures for secondary employment shall be consistent with SPD and City ethical standards, and all other SPD policies shall apply when employees perform secondary employment work,” according to the ordinance.